341 in stock Need More ? 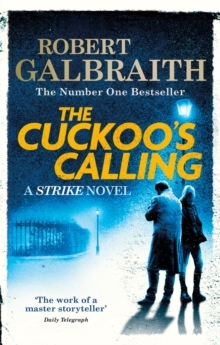 'The Cuckoo's Calling reminds me why I fell in love with crime fiction in the first place' VAL MCDERMID-----Now a major BBC drama: The Strike seriesWhen a troubled model falls to her death from a snow-covered Mayfair balcony, it is assumed that she has committed suicide. However, her brother has his doubts, and calls in private investigator Cormoran Strike to look into the case. Strike is a war veteran - wounded both physically and psychologically - and his life is in disarray. The case gives him a financial lifeline, but it comes at a personal cost: the more he delves into the young model's complex world, the darker things get - and the closer he gets to terrible danger . . . A gripping, elegant mystery steeped in the atmosphere of London - from the hushed streets of Mayfair to the backstreet pubs of the East End to the bustle of Soho - The Cuckoo's Calling is a remarkable book. Introducing Cormoran Strike, this is the acclaimed first crime novel by J.K.